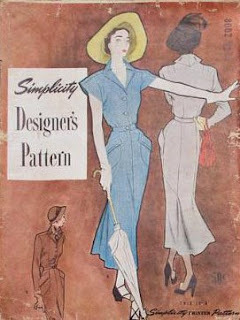 Between 1949 and 1950 Simplicity produced a line of patterns. They started the same time as Vogue's Paris Originals Line. The patterns have an oversized envelope (8" X 11"). They where nice styles, but they are not VPO's. This one is the closer to a Vogue style. Notice the pleating on the front of the skirt. Vogue Paris Original Model - 1189 c. 1952 Dessès - Suit - pleats on the side of the skirt. Didn't someone try that on the Project Runway Post Office challenge with BAD results? 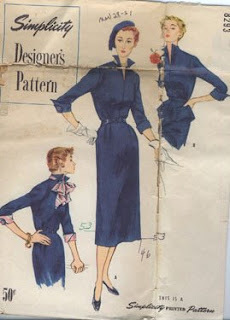 After 1950, this line of patterns was discontinued. I have not seen these patterns in the vintage re-issues. Oh my goodness, I just found your blog and I'm thrilled! I have a growing collection of vintage patterns and I am actually trying to find some 1935 McCall patterns--do you have any idea where I might search for them? I put your blog on my list of favorites--I plan on reading all your posts and learning loads. Thanks! Just found your blog and will have to check through the patterns I inherited from my mom for these. 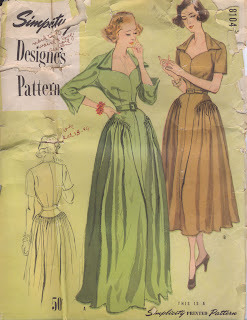 I know I have some of the designer Vogue patterns from the 50's, just their are so many that I need to catalog the collection.